Kumho Tire is a high performance tire company that brings quality and innovative technology to consumers worldwide. With over 50 years of experience, Kumho Tire has transformed its humble beginning in South Korea into becoming the 9th largest tire manufacturer in the world. Kumho Tire USA is dedicated to ensuring the safety and performance of all our products to our customers. The KLS02e is a new generation, premium line haul steer tire. The rib design, with decoupler groove, assures improved steering stability and resistance to irregular wear for maximum removal mileage. Top decoupling groove designed to minimize irregular wear and dissipate heat at belt edge. 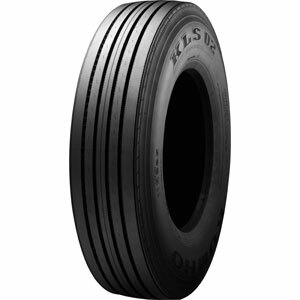 Dual tread radius optimizes footprint shape and contact pressure assures increased removal mileage. 5-rib with multi-sipe design improves wet handling performance. Stone ejectors in the tread block area prevents stone holding to promote even wear and casing durability for retreading. Optimized belt widths stabilize footprint pressure and result in better wear. Advanced tread compound molded at 19/32" increase removal mileage. Maximum speed, all sizes: 75 mph. Call us at 866-989-7201 for ordering assistance!